There are not a great number of dragonflies still around in my area, and those that are present can sometimes be really hard to spot. 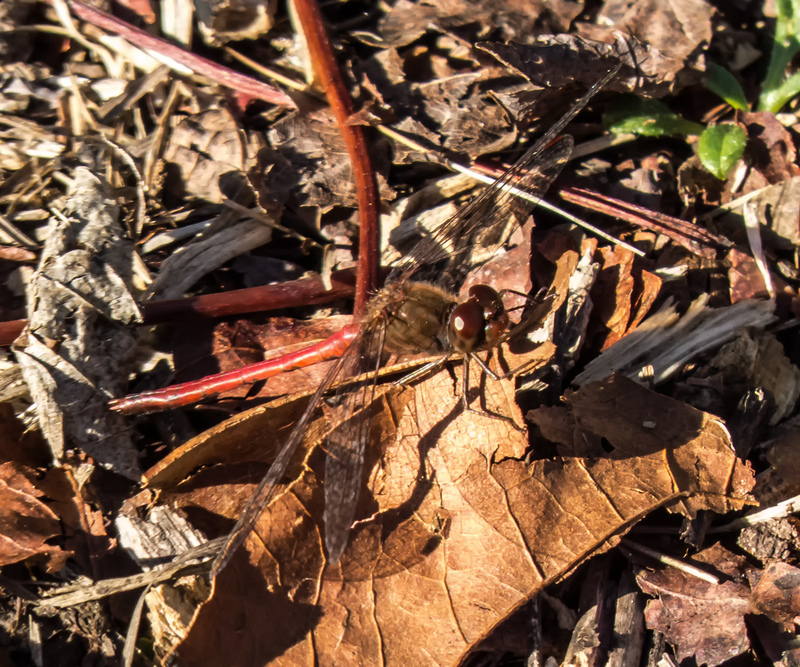 That was definitely the case with this beautiful female Autumn Meadowhawk dragonfly (Sympetrum vicinum) that blended in almost perfectly with the fallen leaves and other debris on the ground at Occoquan Bay National Wildlife Refuge this past week. 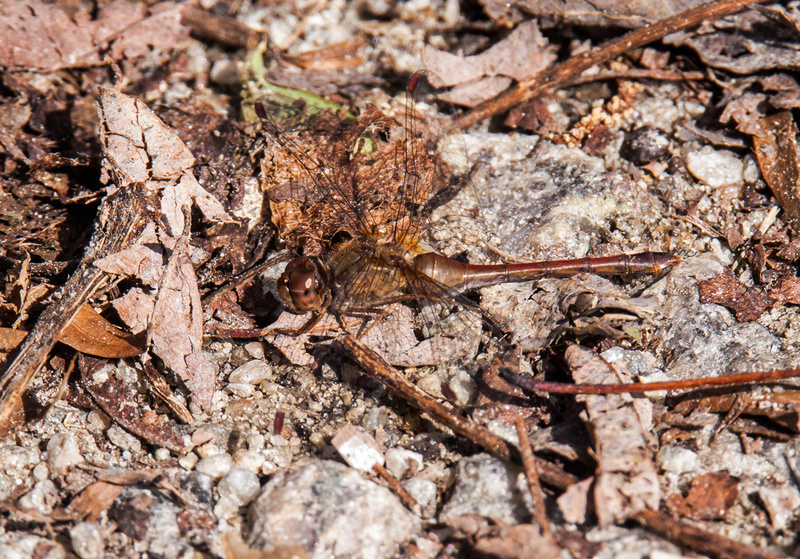 I initially spotted this dragonfly as she was flying and watched her land, but I couldn’t see her at first. Once I saw where she was, I had to back off, because I was shooting with my 150-600mm zoom lens that has a minimum focusing distance of almost 9 feet (270 cm). Autumn Meadowhawks are only 1.2 to 1.4 inches in length (30 to 35mm) and spotting the tiny dragonfly from 9 feet away was a challenge to me and to the focusing system on my camera. I think that I was pretty much at the extreme end of the resolving power of the lens when I took this shot, i.e. it is tough to capture a subject with any detail that is much smaller than this. I have already had to scrape frost from my windshield a couple of times this autumn, so the number of insects will inevitably continue to decrease. Past experience has shown me, however, that Autumn Meadowhawk dragonflies are hardy survivors and I expect to continue to see them for another month or so. Although we are well into October, some of my beloved dragonflies are still hanging on at Occoquan Bay National Wildlife Refuge. Here are some dragonfly shots from the past 10 days of (1) a male Blue-faced Meadowhawk (Sympetrum ambiguum); (2) a female Eastern Pondhawk (Erythemis simplicicollis) with a hoverfly in her mouth; and (3) a female Autumn Meadowhawk (Sympetrum vicinum). 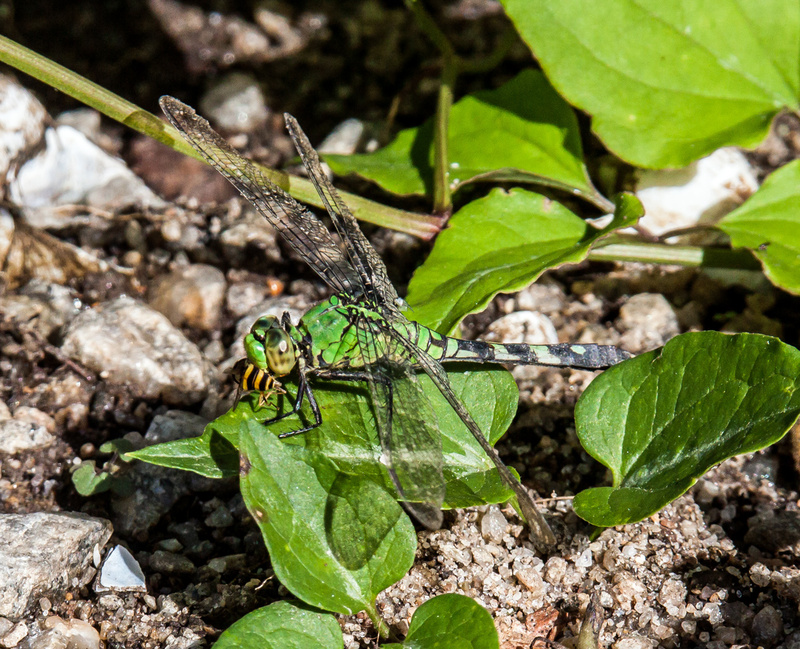 I have also recently spotted Common Green Darners, Wandering Gliders, and Black Saddlebags patrolling over the fields. Unfortunately, none of them paused long enough for me to get shots of them. All three of those species are migratory species and they may have been fueling up for a long journey ahead. Now that fall has officially arrived, I look forward to seeing more Autumn Meadowhawk dragonflies (Sympetrum vicinum), like this stunning female that I spotted last Friday at Occoquan Bay National Wildlife Refuge. 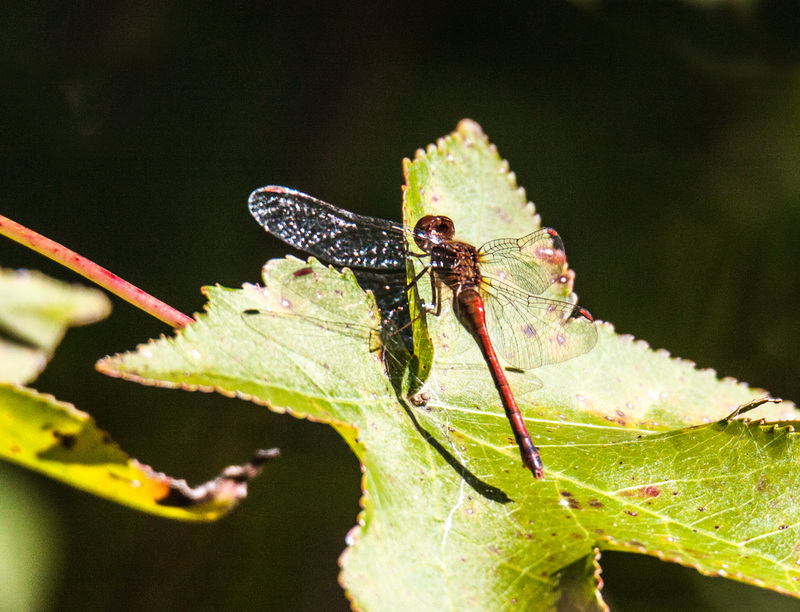 Adult males of this dragonfly species are bright red in color, but females can be either tan or red. The “spike” near the end of the abdomen makes it easy. though, to identify this one as a female. 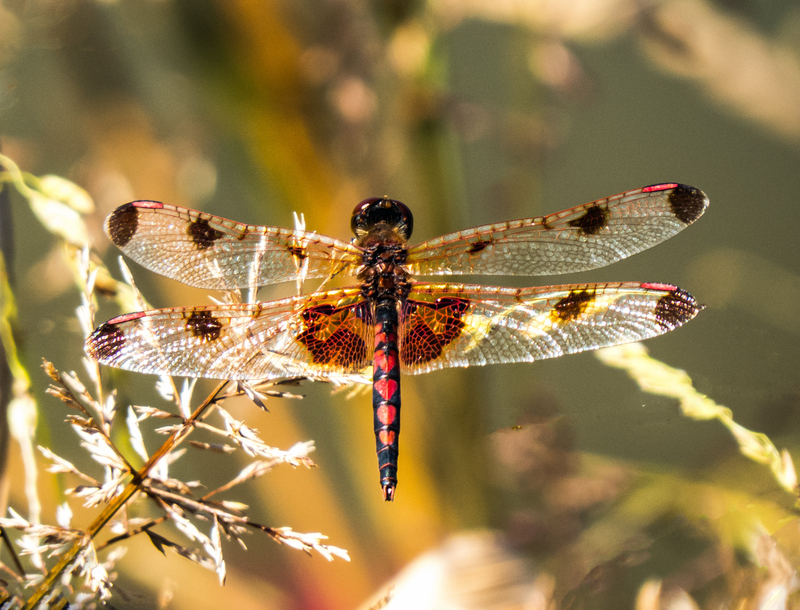 In Northern Virginia, where I live, the Autumn Meadowhawk tends to be the latest surviving dragonflies—I have spotted them in mid-December and others have seen them in early January. With the temperatures today reaching almost 100 degrees (38 C), I long for the cooler weather of autumn, my favorite season of the year. The aptly named Autumn Meadowhawk (Sympetrum vicinum) is generally one of the last surviving dragonfly species each year and I was therefore a bit surprised last week when I spotted this young female Autumn Meadowhawk. The very clear wings and pale body coloration are an indication that it had only recently emerged. Summer, though, is the prime season for dragonflies and I hope to be able to take advantage of this season to see lots more of them. I’ll just have to make sure that I pace myself and stay well hydrated as we move through a period of exceptionally hot weather. 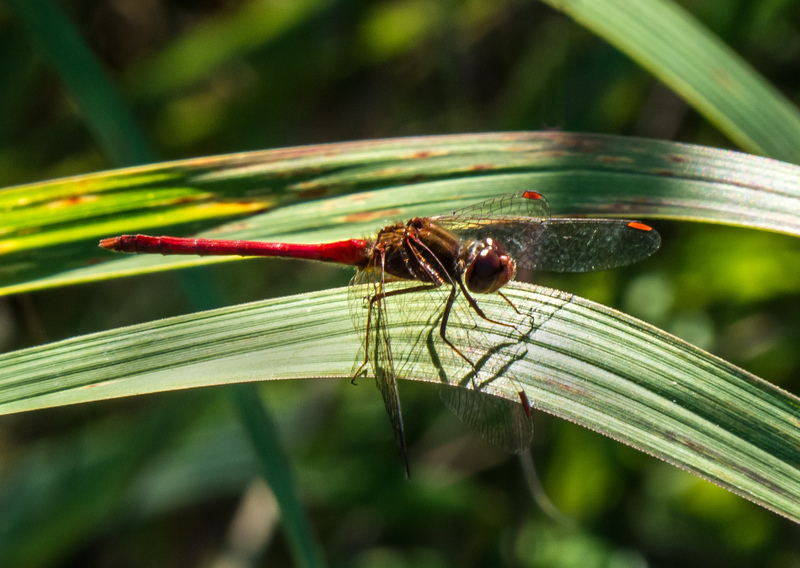 As October begins, I renew my search for red dragonflies. Autumn is quite naturally the season when Autumn Meadowhawks (Sympetrum vicinum) appear along with their more gaudily-colored brethren, the Blue-faced Meadowhawks (Sympetrum ambiguum). Both of these species have bright red bodies that should be easy to spot, but they like to perch low to the ground and sometimes even on fallen leaves, so you really have to pay attention. 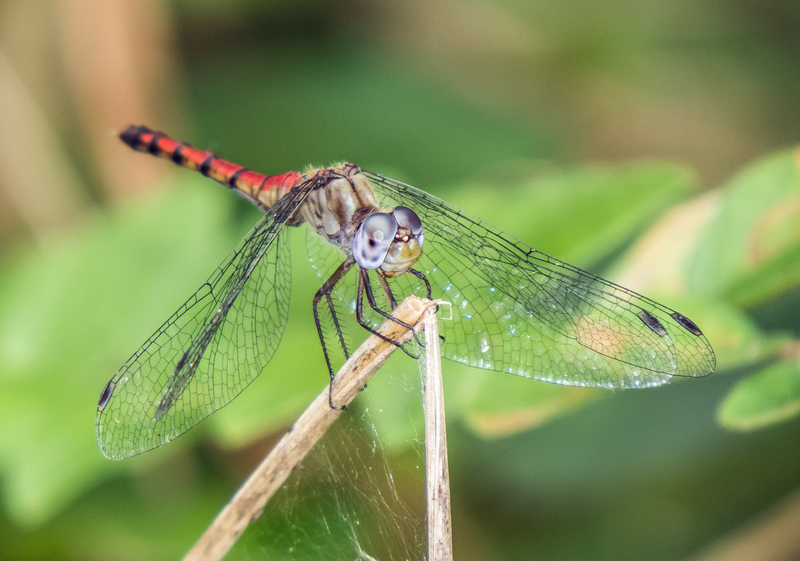 I was a bit shocked on Monday to see some other small red dragonflies—at least three male Calico Pennant dragonflies (Celithemis elisa) were active at a small pond at Occoquan Bay National Wildlife Refuge. Calico Pennants are generally a summer species and I have featured them a couple of times earlier this year in this blog. According to the Dragonflies of Northern Virginia website, their peak flight time is June to July and their late date is 23 September (I saw the one below on 2 October). 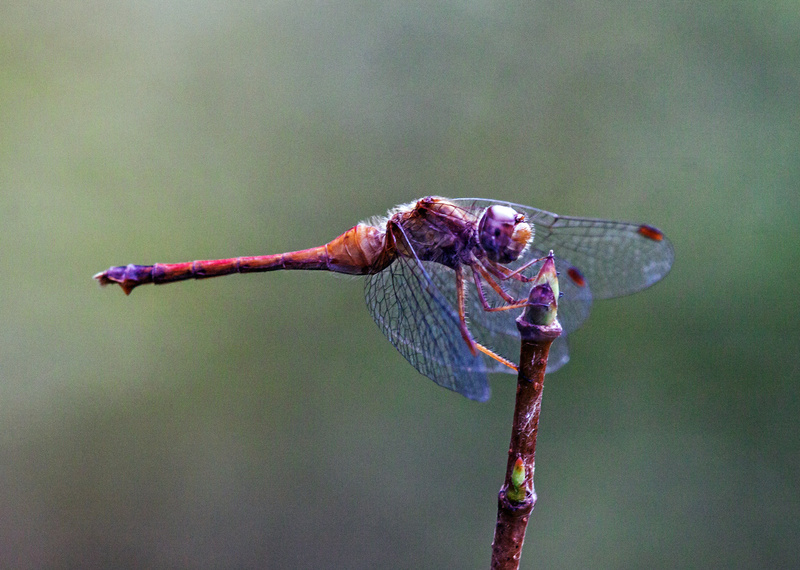 There are still other active dragonflies, but over time their numbers will continue to drop. Autumn Meadowhawks, though, usually stay with us into December and, if I remember correctly, occasionally even into January. 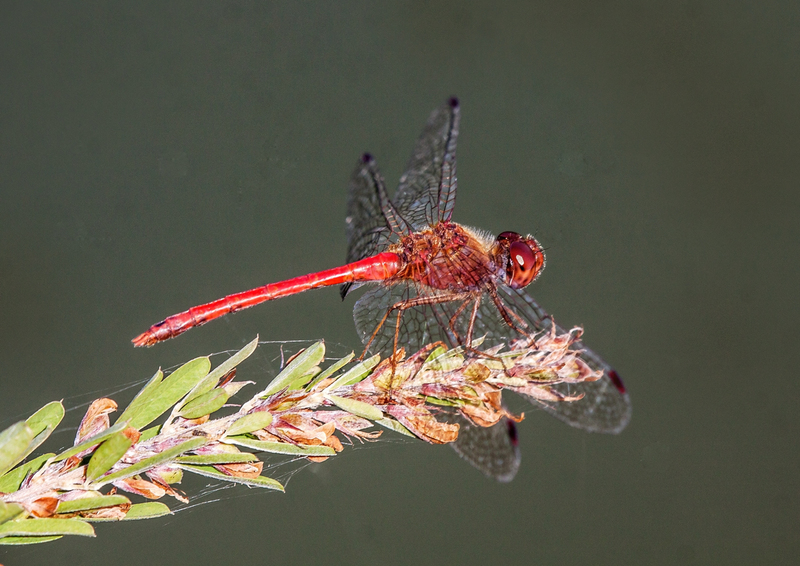 I’ll be continuing my October hunt for red dragonflies into November and beyond. I am not about to make a sign proclaiming that “The End is Near,” but I couldn’t help feeling a slight sense of impending doom when I spotted an Autumn Meadowhawk dragonfly (Sympetrum vicinum) this past weekend. 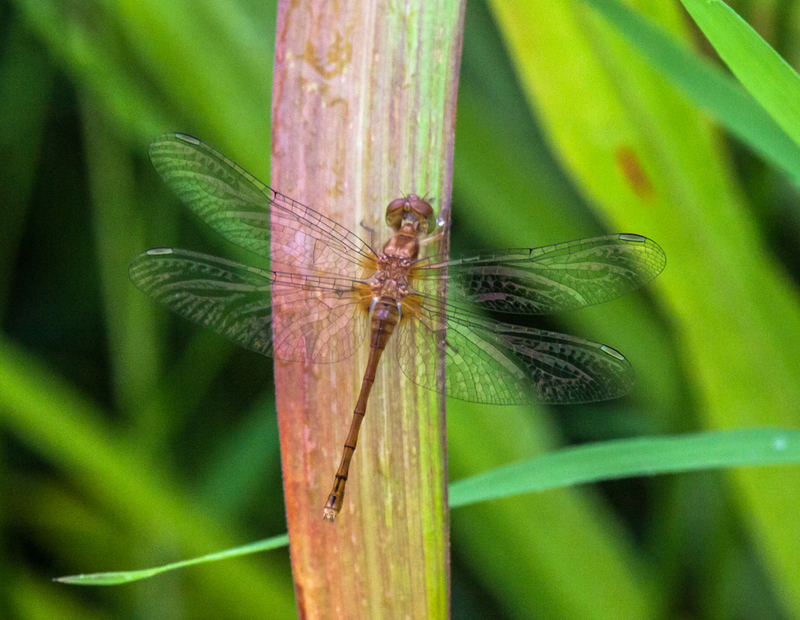 In our area, Autumn Meadowhawks are the ultimate survivors of the dragonfly season and they can usually be found well into December and occasionally into January. 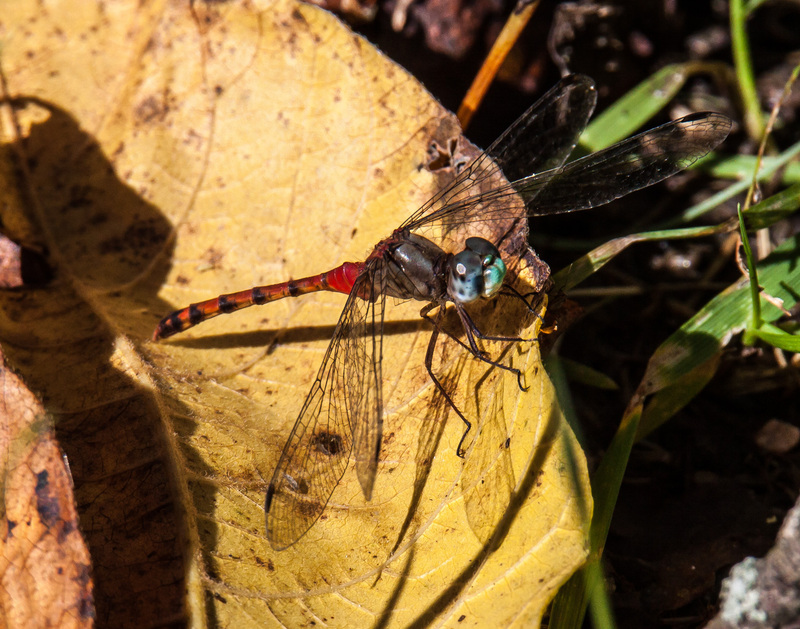 This pretty red and brown dragonfly is a harbinger of doom—inexorably winter is approaching and dragonflies will eventually cease to fly until the spring. For now, though, I’ll continue to search for these spectacular aerial acrobats and enjoy their beauty and skill when I am lucky enough to find one.